Can you believe that January is almost behind us? Boy, do the months seem to fly right by. As far as resolutions go, how are you doing? I only made a few resolutions for 2016, as I really wanted to have a chance at actually seeing them through. One of my resolutions involved my girls and their toys. I wanted to make 2016 the year that I finally got a hold of the toy clutter in our house. How am I doing? Well, let's just say I am really try hard at this one, as I would love to reclaim some space in our house where their toys are overflowing. It doesn't make keeping this resolution any easier when we just had a visit from Santa and he brought what seems like a boat load of new toys for the girls. Thankfully this year Santa got the memo that we didn't two of everything, which made for less toys (or so I thought). What Santa didn't bring, family and friends seemed to fill the void for the girls. :-) But, like most kids, the girls got overwhelmed with the toys from the start and now a month after Christmas the bulk of the new toys are sitting in corners of rooms throughout the house. The girls have found favorite toys they continually look for and play with, while the others sit helpless, as if they were toys from Toy Story, hoping one of the girls will stumble upon them and pick them up. Do you find yourself in the same predicament as me and an influx of toy clutter? If so, how are you handling it? I asked a handful of my friends this the other day during a playgroup meet up and was surprised at their different responses. One mom said she would box up the toys that weren't being played with and store away for a rainy day. Then, she would sporadically pull the toys out and they become "new toys" that the kids forgot about. Being "new" toys, they would show interest and play with them. Other moms said they gathered out toys the kids grew out of before Christmas and donated them, as to make room for the new times that Santa would bring. Another mom, who also had two little ones, found herself feeling overwhelmed with the toy clutter and not knowing where to start to combat it...just like I was and still am feeling. Wherever I turn I see a toy that the girls leave out, only to have to pick up and a place to store it. As I sat and listened to the moms, I was happy to hear two moms talk about Pley.com and how they utilize this service for their kids, and which helps prevent toy clutter in their house. You may recall Pley.com as I shared about it a few times on my blog. I tried it back when we only had Savannah and far fewer toys. But, then when we had two and our lives got busier I forgot about this service. It was nice to hear other moms talk highly about Pley.com and hear all the positive things about it. Just hearing them rave about Pley.com made me want to give this service a try again. Maybe this is what I need to help get control over the toy clutter and need for "new" toys in our house each month. Here is more about Pley.com if you are not familiar -- just think of it as a rental service but for toys. "Pley helps smart parents save money, reduce clutter and help the environment, while raising brighter kids. For a monthly fee, members receive unlimited toys (one at a time) delivered directly to their door. We offer a range of plans starting as low as $19.99/month and all plans include free delivery and unlimited rentals." Pley is a toy rental service. Not just that, it is also a socially-responsible company that aims to change how families consume, interact and spend time together. Leveraging collaborative consumption, we aim to raise a more creative and skillful generation that follows the principles of open-ended play and waste reduction, while emphasizing the benefits of sharing and giving back to the community. For a monthly fee, members receive unlimited toys delivered directly to their door. When your child is done with a toy, you simply return it back and get another toy mailed right to your door for them to enjoy, until they grow tired of it and want something new. No more wasting money on toys that are left gathering dust on your shelves. Stay tuned next month when I will share an update on my toy clutter resolution and more about Pley.com and how my girls and I are liking this toy rental service. I will also be sharing ways to keep your child's toys feeling fresh and exciting during these dreary winter/spring months. Who knows...maybe I will also through in a few Easter gift ideas. I know, I know...let's get through Valentine's Day first! :-) I agree. 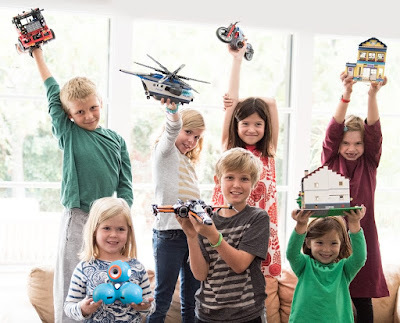 In the meantime, be sure to head on over to Pley.com to learn more about this wonderful toy rental service. Maybe this is what your family has been searching for when it comes to taking control over the toy clutter in your house. This sounds like a great program as I am always fighting clutter.